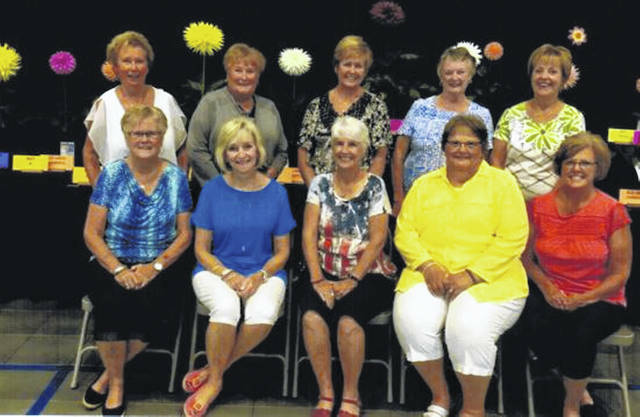 The September meeting of the Deercreek Daisies was hosted by Julie Schwartz and Judy Gentry. The group traveled to Marysville for the 53rd Greater Columbus Dahlia Society Show held at the YMCA. They started the day with lunch at The Half Pint in downtown Marysville. The lunch was very good with lots of unique items on the menu. The group would love to return to sample second and third choices. After a short meeting, the Daisies gave some informational facts about Dahlia’s. For instance, there are 42 species of dahlia’s and the most popular color is red. Dahlia’s originated in South American and were first grown for food. They were also used for dying fabrics and the two colors they produce were yellow and orange. Dahlia’s are tubers and need to be dug up in the fall and kept in a dry, dark place to plant again in early spring. Winners of the door prizes were Jeanne Miller, Connie Lindsey and Rita Lanman. Members attending were Billie Lanman, Joyce Schlichter, Emily King, Jeanne Miller, Rita Lanman, Connie Lindsey, Kendra Knecht, Julie Schwartz, Judy Gentry and guest, Marilyn Fogle. The next meeting will be hosted by Kendra Knecht and Jeanne Miller.